There are a range of option to choose to ensure your wooden garden furniture looks as good next spring as it did last year. Here are several tips to help you store, maintain and protect the beauty and integrity of your wooden furniture. When protecting wooden furniture, you typically use products with caution warnings. Make sure you protect yourself before taking any action with your garden items. Usually, bleach products do not mix well with wooden furniture. But, if you do use bleach, make sure you have proper eye protection. Use only in a well-ventilated area and wear rubber gloves. This is practical advice when working with paint, varnish, sealants and other products. You were issued one pair of eyes and lungs. Take care to protect them first. Before you store your wooden garden furniture, give it a deep cleaning. Start by using a broom or a brush to remove any surface dirt. Next, use a soft scrub brush with a solution of mild dishwashing liquid and water to clean the wood. Always scrub in the direction of the wood grain. If you have stubborn stains left, use a mild solution of oxygen bleach and water to scrub the spot. Lightly sand any remaining stains. Once your outdoor wooden furniture is clean, rinse it with a garden hose and let it dry completely. If your garden furniture has cushions, they need special care. Cushions tend to mildew at the first sign of damp weather. Wipe them down so you will not have to deal with dirty cushions next spring. Then, place them in a warm place to dry. Once they are completely dry, store them in a cool, dry place. Some wooden furniture pieces have special compartments built under the seat. When you lift the seat by the hinges, storage bins are available. Once your outdoor wooden furniture and cushions are clean and dry, look at storage options. If your wooden garden furniture is in a protected area and you live in a mild climate, use furniture covers and store them outdoors. Some people make a point of covering their patio furniture every evening. You can find outdoor furniture covers in patio or home improvement stores and online. Measure your furniture first to get the best fitting covers. This helps protect the wood from harmful elements. Using your garage or basement to store your garden furniture might be difficult. If you do not intend to use your outdoor furniture for several months, try keeping it in a storage shed or unit. Garden sheds are a multipurpose solution and a garden shed would provide the storage space you need for your garden chairs. Plus, it gives you room for various garden projects. You have your choice of softwood or hardwood for outdoor garden furniture. Softwood requires more attention to maintain. But, softwood is a more affordable choice for outdoor furniture. Good softwood selections include white oak, cedar and most acacia woods. Naturally rot-resistant, these woods hold up well under most weather conditions. If you live in a milder climate, your garden furniture can remain outdoors. Place it in a sheltered area where the wind and elements do not deposit dust and debris on the wood all the time. You do not want your wood to age, chip or splinter. Teak oil is a good wood preservative, but you should reapply it often. Apply a good water sealer to protect the wood from rain. It helps damp wood under the sealant dry faster to avoid wood rot. Sealant is clear, so it allows you to enjoy the natural beauty of your wooden garden furniture. In harsher climates, softwood furniture needs a higher level of protection. If you plan to leave it outdoors, check the list below for your best options. 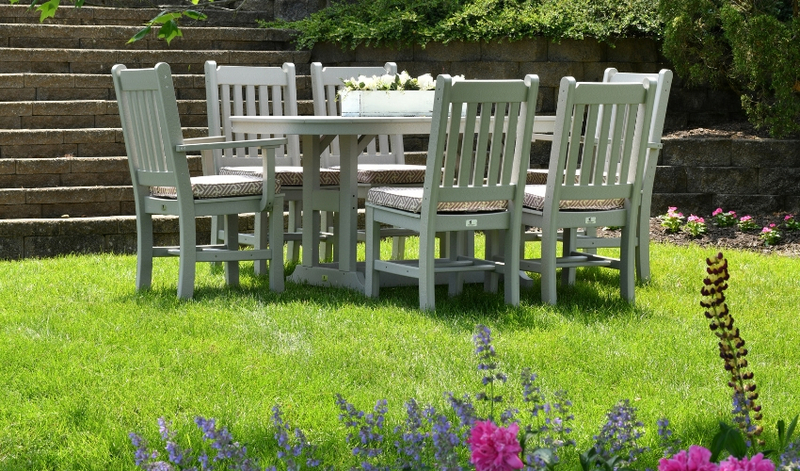 Latex paint is the best way to protect softwood outdoor furniture in harsh climates. A drawback is losing the wood’s beauty. It does protect wood furniture from rot, UV ray damage, disintegration and destruction. A latex-based paint provides better protection than an oil-based paint. Touch it up periodically if fading or chipping occurs. Varnish or wood stain provides some protection from the elements. Reapply often to keep your wooden garden furniture looking good. Teak oil helps keep your softwood looking nice, but it does not keep the wood from splintering. A heavy plastic sealant is a good way to maintain your outdoor wooden furniture. Especially if you plan to keep it outside year-round. Use caution if you plan to leave your cushions outdoors as well. UV rays weaken wood, plastic and fabric as does exposure to outside elements. Hardwoods do not need the preservation process that most softer woods need. However, this wood typically costs much more than the softwood used in most commercial wooden garden furniture. Here is a list of typical hardwoods used outdoors and how to keep them looking good. Shorea – like other fine woods, it weathers to a silvery gray colour. This tropical hardwood has a naturally high oil content. This makes it water resistant and unlikely to rot. It tends to be insect-resistant as well. Similar in make-up to teak, shorea handles all types of weather conditions. To clean or maintain shorea, spray it lightly with water or use a mild detergent with water and rinse well. Teak – this beautiful hardwood resists water, rot and insects. Teak oil keeps this wooden furniture safe from food and drink stains. Teak wood furniture kept in arid and dry climates needs regular applications of teak oil. Clean teak as you would shorea. Ipe – this South American hardwood goes by other names including Pao Lope, ironwood and Brazilian walnut. Ipe comes from the forests of Brazil and might be three times harder than teak. It weathers the same as shorea and teak. Clean it with mild detergent and water and allow it to dry. Do this every three months before you apply teak or hardwood oil. Power or pressure wash your wood garden furnishings to remove surface debris then let it dry. Next, sand your wood furniture and refinish it with products designed to protect it from further damage. If you have hardwood, work teak oil into the wood going with the grain. Apply hardwood oil regularly throughout the year to prevent further damage. Finally, repair your outdoor wooden garden furniture promptly. If you notice loose screws or bolts, tighten or replace them. While many items are weather resistant, outdoor garden furniture eventually shows wear and tear. Following a simple routine of maintenance, care and repair can extend the life of your outdoor wooden furniture by decades.